Today at their Double Exposure event in New York, HTC has announced the Desire EYE. The major feature on the Desire EYE is its 13MP front facing camera which should hopefully take some of the best selfies of any smartphone. The internals are also an interesting story. While devices sporting HTC's Desire branding are typically more budget oriented devices, the Desire EYE packs significantly more powerful hardware than other Desire device. It has a 5.2" 1080p IPS display, and Qualcomm's Snapdragon 801. BoomSound continues to be present with two TFA9887 speaker amps. The full list of specifications has been laid out below. Camera 13MP rear camera, 1.12 µm pixels, 1/3.06" CMOS size (Sony IMX214), F/2.0, 28mm (35mm equiv) lens. 13MP front camera, 1.12 µm pixels, 1/3.06" CMOS size (Sony IMX214), F/2.2, 22mm (35mm equiv) lens. 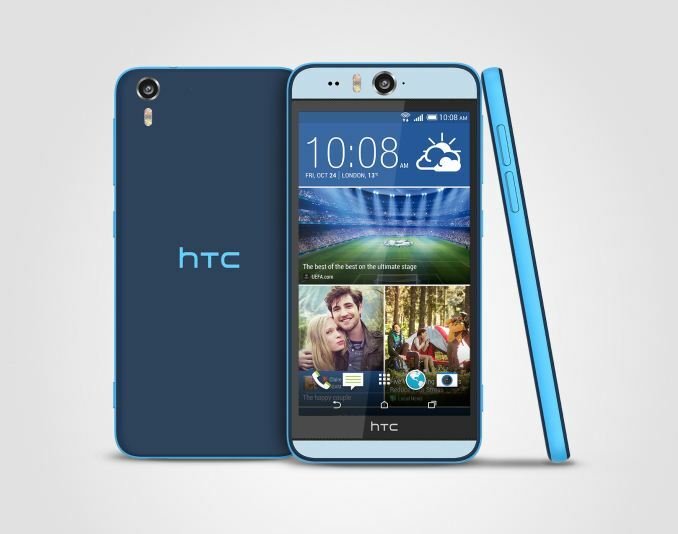 Owing to its 5.2" display, the Desire Eye has a larger height and width than HTC's M8 and E8 phones. At 8.5mm it's 1.35mm thinner than both of them, and at 154 grams its mass sits between the lighter E8 and heavier M8. Also similar to the E8 and M8 is its hardware platform which includes Qualcomm's MSM8974AB at 2.26GHz, 2GB of LPDDR3 RAM. The finish on all color variants is matte plastic throughout, and the two-tone "Doubleshot" finish really makes for an even better design than what we saw in the E8. The power button has also been moved to the side, and we see a new two-stage camera button. The latter is definitely useful, but the pressure needed to trigger the second stage is a bit too high in my experience. The Desire EYE also sports water resistance, rated for immersion in 1 meter of water for up to 30 minutes. HTC has gone the extra mile here by implementing water resistance without annoying plastic flaps that are easily torn off. Instead, we see rubber gaskets around key areas and "short protection" on the USB port. 802.11ac isn't present, and the battery is on the small side, but overall the Desire EYE has solid specifications. Like I mentioned in the beginning, the major marketing and selling point for the phone is definitely the front facing camera. The Desire EYE uses the same Sony IMX214 sensor for the front and rear cameras. IMX214 is formidable as a sensor for rear cameras, and this is the first time we're seeing it also implemented as a front-facing camera. By using two separate cameras instead of a rotating upper section like on the Oppo N1, HTC has been able to customize the cameras for their intended use case. The rear camera has a wider F/2.0 aperture and a longer 28mm focal length than the front-facing camera. The front-facing camera is optimised for a wider 87 degree field of view with its shorter 22mm focal length. Both cameras have a max ISO of 3200 and a max exposure time of 1/9s. In some casual testing it seems that there is a bit of color noise in low light, but it's otherwise well-suppressed. Detail is definitely good but there're noticeable sharpening kernels at the base settings which is a bit disappointing. The rear camera seems to have detail similar to the Butterfly 2, which is comparable to most 13MP cameras in flagships today. HTC is including a number of software features that add additional camera functionality, collectively called the HTC EYE Experience. HTC's face tracking keeps the user's face in focus and crops the image to frame it. Up to four people can be tracked and framed at the same time. HTC's Split Capture feature combines simultaneously taken photos or videos with the front and back cameras into a single image or video. Voice Selfie allows the front camera to take a photo by smiling, and to take a video by saying "action" or "rolling"
HTC is also bringing over features that were introduced earlier this year with the Desire 820. Face fusion allows the user to merge their face with that of their friend or another person. Live makeup allows the user to adjust the level of skin smoothing with a live preview before capture. HTC plans to roll out the Desire EYE on carriers in Europe, the Middle East, Africa, Asia, and the United States from October onward. Pricing is said to be around that of the One (E8), and should supersede the One (E8) in those markets. Larger screen and smaller battery = fail. They also skipped one of the biggest advantages of plastic... wireless charging. The bezel's seem needlessly large, one of the worst in the market. Somewhere around 66.5%. N5 = 71%, S5 = 79%.